Many of the thermostats made these days have a sleek, futuristic look. The Honeywell RTH6580WF actually has a more conventional look. It is perfect for users who want to update their thermostat but still keep a traditional look. The reason behind such look is the fact that this is an older model from Honeywell. But, that does not mean the unit is outdated. Far from it, this thermostat still offers advanced programming and for its price it is an exceptional value. The Honeywell RTH6580WF programmable thermostat is compatible with a vast majority of North American ventilation, air conditioning, and heating systems. This thermostat requires a C-wire (or Common wire) to function properly, and not all HVAC systems have it. However, you can still install this unit if you do not have a C-wire with the help of videos from Honeywell that show a work around. Keep in mind that Honeywell RTH6580WF is a programmable unit, not a smart thermostat. This means that you get to program your thermostat up to seven days in advance, but also that it lacks certain automatization features that come with the most recent thermostats. If you’re looking for a wi-fi enabled thermostat you can check out our guide and see how the RTH6580WF compares. Those who want to program their thermostat ahead of time. Those who want to save money on their energy bills every month. Those looking to manage their thermostat with their smart phone. Those who don’t like the look of trendy thermostats. The Honeywell RTH6580WF looks like a traditional programmable thermostat that you’re used to. 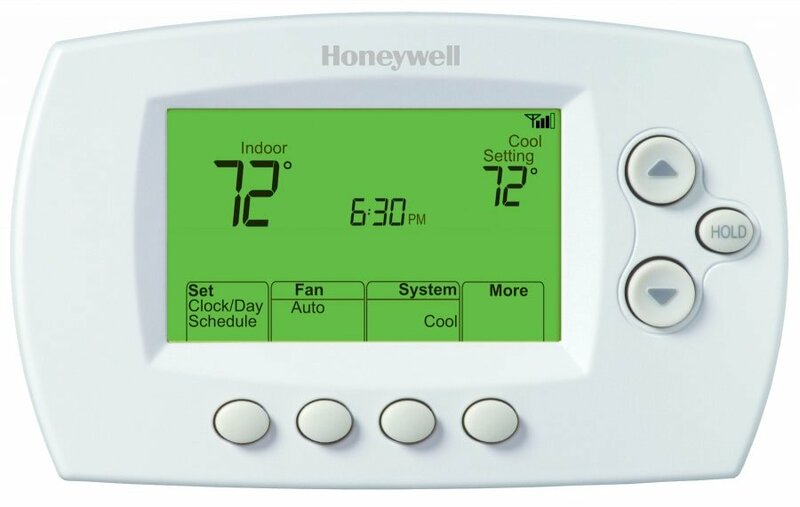 This programmable thermostat from Honeywell gives you the 7-day programming option, meaning that you can program your HVAC system seven days in advance. In addition, you can also choose four periods per day that can be programmed. For example, you can put the heat on 72 in the morning, 65 during the day, 70 in the evening, and 72 during the night. The unit is pre-programmed for saving the energy as well. Honeywell found out that users of properly-programmed thermostats can save up to 33% on their energy bills. What is one of the greatest features of this unit is the pre-programmed energy saving that was already mentioned. With the Honeywell app that is compatible with the unit, users can program this thermostat remotely. The unit also shows its users the local weather report. This means that the users can adjust the temperature at home (regardless of their location) so it is optimal and save some money as well. Some users may dislike the old-school look of this thermostat. 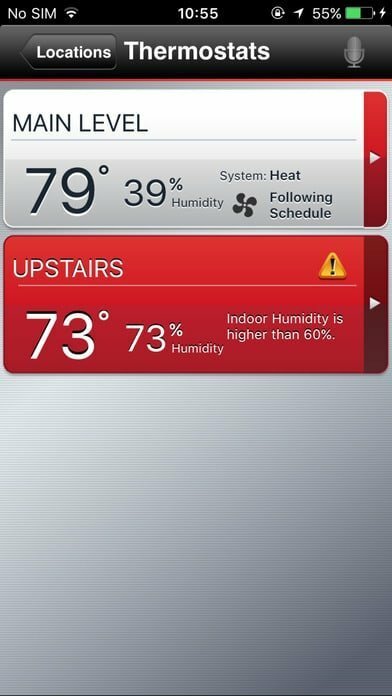 However, the free Honeywell “Total Comfort Connect” app that is compatible with iPhone and Android smartphones as well as PCs is very modern and easy to use. The Total Comfort Connect app makes it easy to adjust the temperature, create a new schedule, or adjust an existing schedule. The app allows the user to control the temperature remotely, set up schedules, override current schedule and even get alerts. The app also includes a list of locations, in case the user has multiple Honeywell thermostats installed on different locations. Some devices can’t run without Wi-Fi, but that is not the case with Honeywell RTH6580WF. If the internet goes out, the thermostat will simply continue using the schedule that was set up before; the one it remembers. On the other hand, the unit will shut down when the power goes out. This is the case with almost every thermostat on the market. Even those that have batteries will not work since HVAC systems still can’t operate without electricity. As soon as the power comes back on, the unit will continue working normally. Easy on the wallet – you can get it for under $100. Easy-to-read digital display with a backlit background and large black characters. 7-day programming with 4 program periods per day. Smart Response Technology which learns the user’s desired heating and cooling cycles. Real-time clock which works even during power cuts. C-wire is required for this unit. Does not work well with some routers. Complicated programming for some users. Is Honeywell RTH6580WF Compatible With My HVAC System? If you already have a thermostat, does it have “110V” (or higher) written on it? Are there any thick wires that are connected using wire nuts? Is there a wire connected to a terminal labeled “C”? Yes: The unit will definitely work with your system. No: Check the next question. Is there an extra wire on the thermostat wall plate that is not connected to any terminal? Is there a wire connected to terminal labeled “G”? Honeywell RTH6580WF is an older thermostat. Its interface is not as modern as that of the thermostats that appeared on the market most recently. But, its display should not be a concern to the users because the unit operates using the latest technology. Without a doubt, it will work as well as the modern thermostats. This unit is perfect for those who are looking for an upgrade to their traditional thermostat but are not able to spend much. The thermostat may not be as smart as the most advanced units, but it is smart enough to allow its users to set four different temperatures for each day of the week. If you’re looking for a thermostat with more smart functionality check out our guide to the Best Wi-Fi and Programmable Thermostats.